Submit your pitch and become a legend! 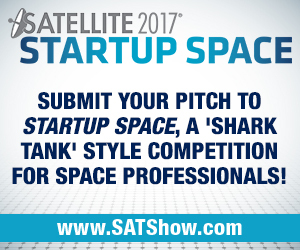 Now’s your chance to get involved with SATELLITE 2017’s Startup Space, a Shark Tank-style pitch competition that gives entrepreneurs and inventors a chance to share their new business and technology ideas with a panel of highly accomplished space professionals, investors, thought leaders, and fellow entrepreneurs. The Startup Space winning participant will be honored at the SATELLITE 2017 Awards Reception, so submit your entry now! The SATELLITE 2017 Conference Program Schedule is now live on the website! Visit the site to see the sessions and conference tracks we have planned for SATELLITE week. Several new speakers and presentations will be announced soon. If your company is involved in connectivity, hardware, imagery & sensing, finance or access to space and you haven’t yet reserved your place among more than 350 leading satellite and aerospace leaders at SATELLITE 2017, what are you waiting for? With more than 94% of space already reserved, your opportunity to reserve a prime location on the show floor is slowly slipping away. To learn more about the largest event in the world focused on satellite communications and space-based technology, contact Michael Cassinelli today at +1 (301) 354-1691 or mcassinelli@accessintel.com. Ready to reserve your space? Download and submit the exhibit space contract today! [Via Satellite 11-10-2016] Despite a vision from top Air Force officers that reusable rockets can play roles in future military missions, a conservative safety culture on launch ranges and institutional bureaucracy are slowing the service on its path to embracing the technology and, accordingly, low cost launch, when it is ready in four to five years..